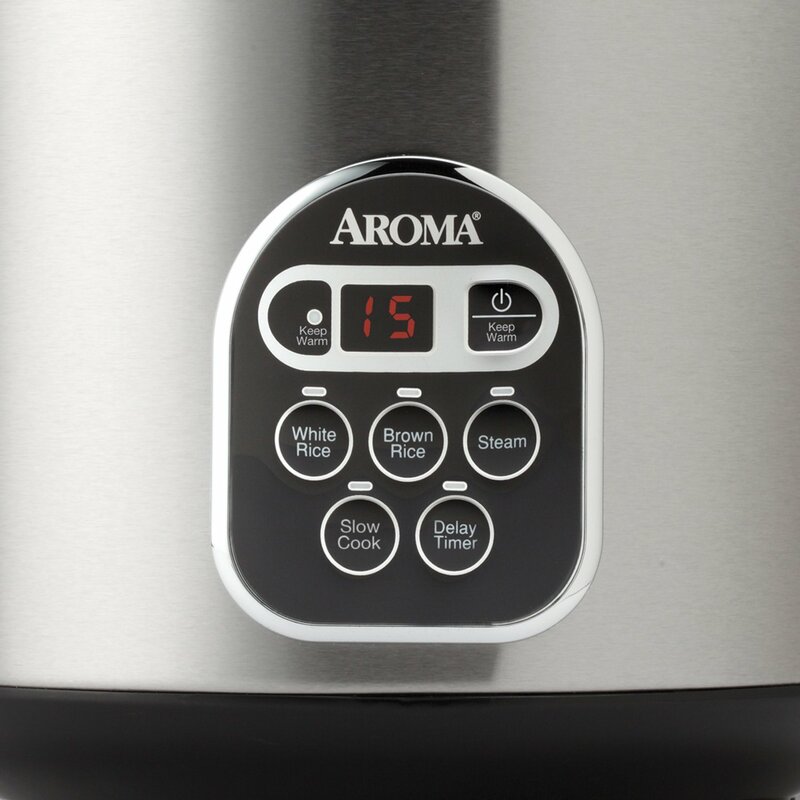 Easy-to-use digital controls for white rice, brown rice, programmable steam and keep-warm. The Aroma 10-cup (uncooked) 20-cup (cooked) digital rice cooker food steamer is truly a meal making powerhouse. 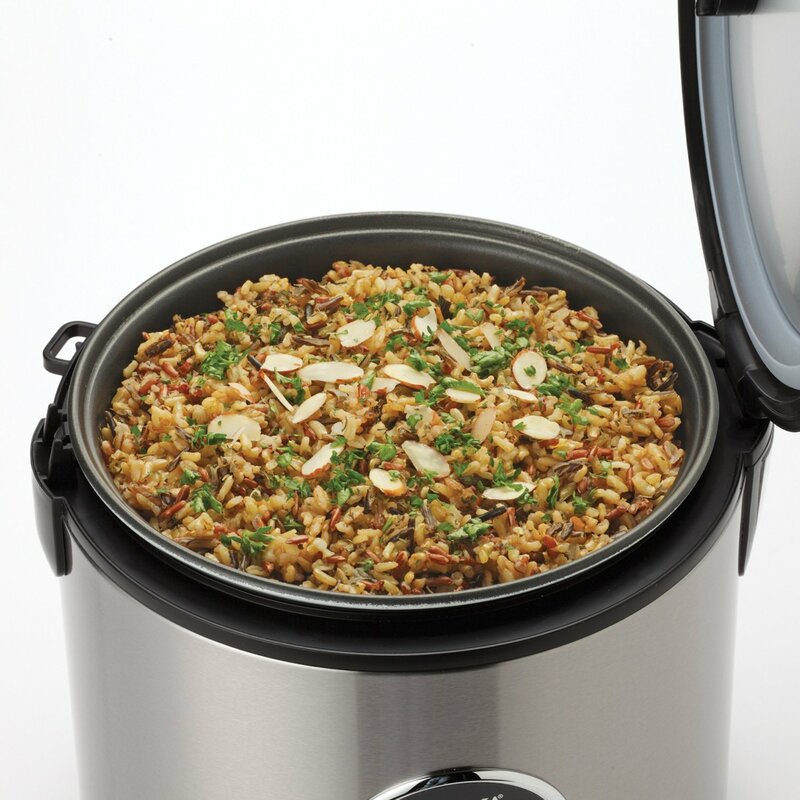 Not only does it make perfect rice and steam delicious meats and vegetables, but it also features a programmable slow cook function. Set it to slow cook up to 10 hours for an amazingly tender roast. 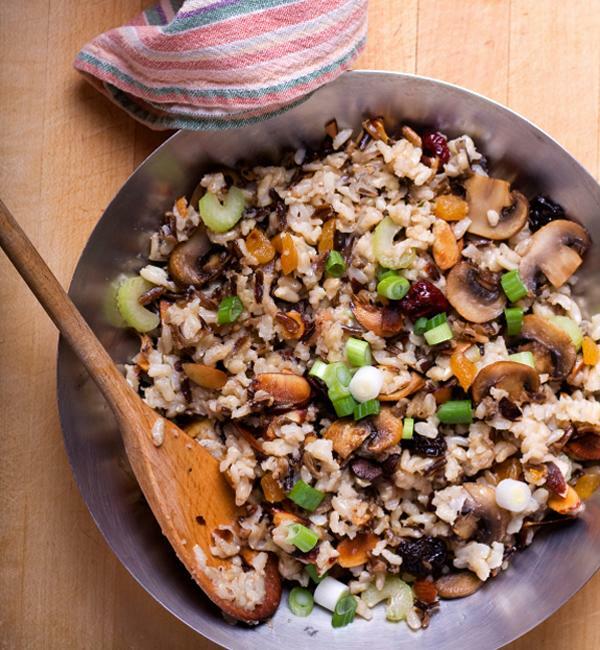 Surprise the family with a delicious jambalaya that takes just minute to prepare. Steam chicken and broccoli while cooking brown rice for an easy, healthy meal in one pot. 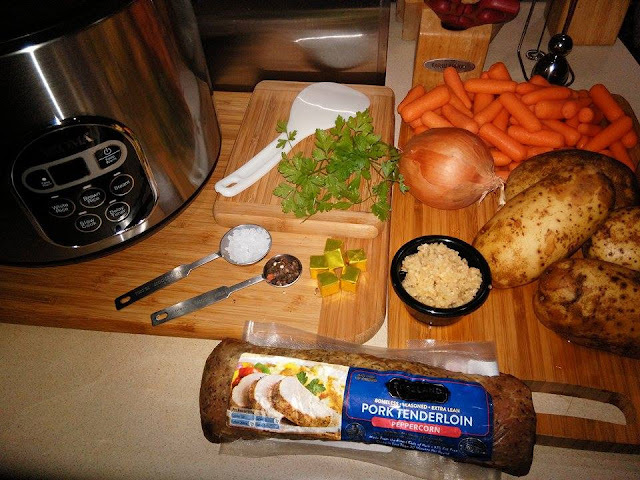 The meal making options are nearly endless. The easy-to-use digital controls include specialized white and brown rice functions, programmable steam, programmable slow cook and keep-warm and a 15-hour delay timer. 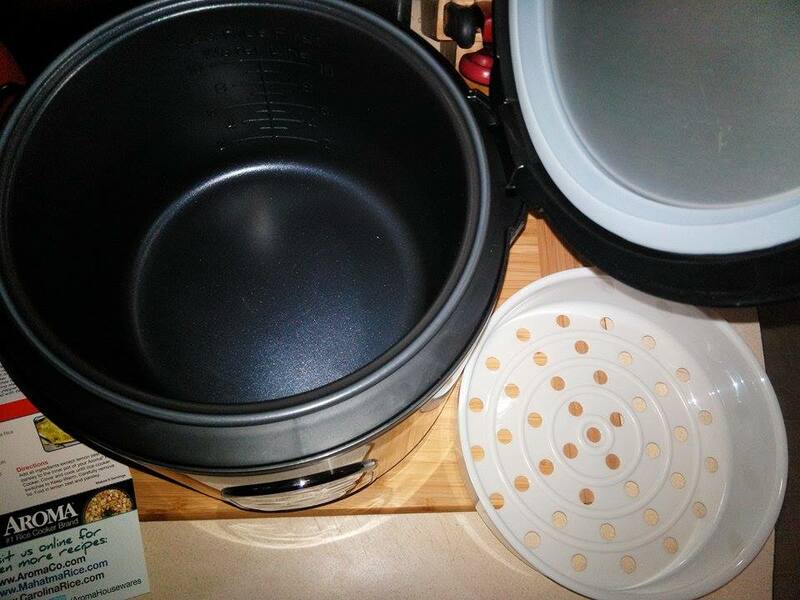 When the cooking is done, the nonstick inner pot removes for quick and easy cleaning. Measuring cup, steam tray and serving spatula included. 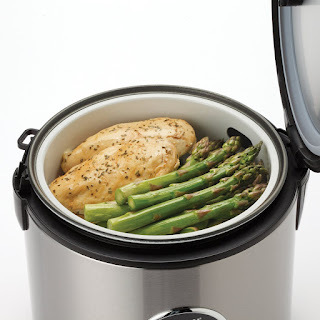 Stainless Steel Exterior, Nonstick Inner Pot. 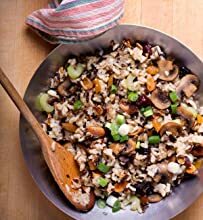 Let Aroma do the cooking: restaurant-quality rice, healthy steamed meals, delicious one-pot dishes. 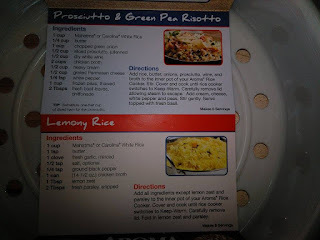 .. Aroma takes the 'cook' out of home cooking - turning kitchen time into your time. 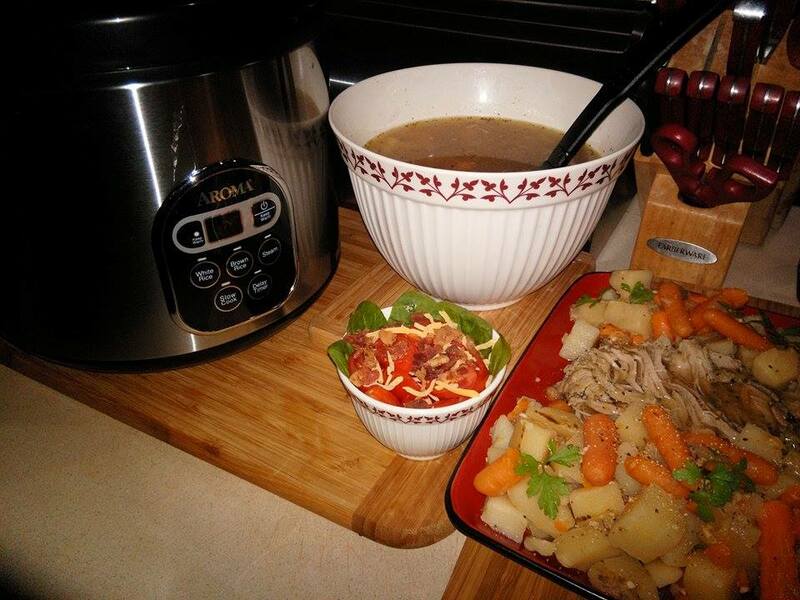 Help the kids with homework, get creative at play time, or pick up that novel you've been waiting to dive into. 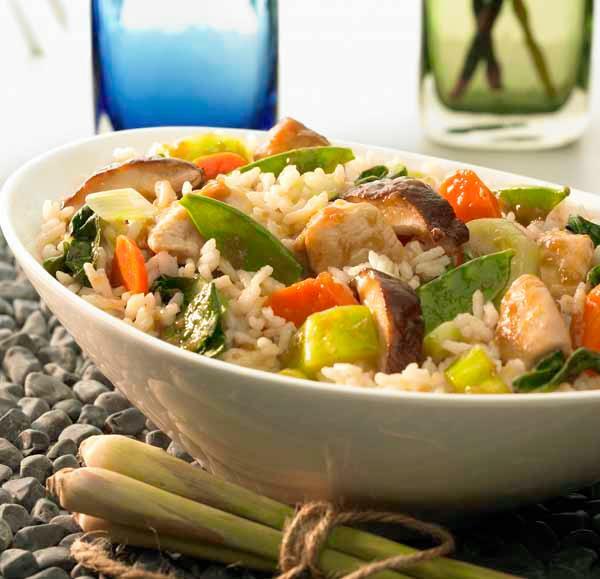 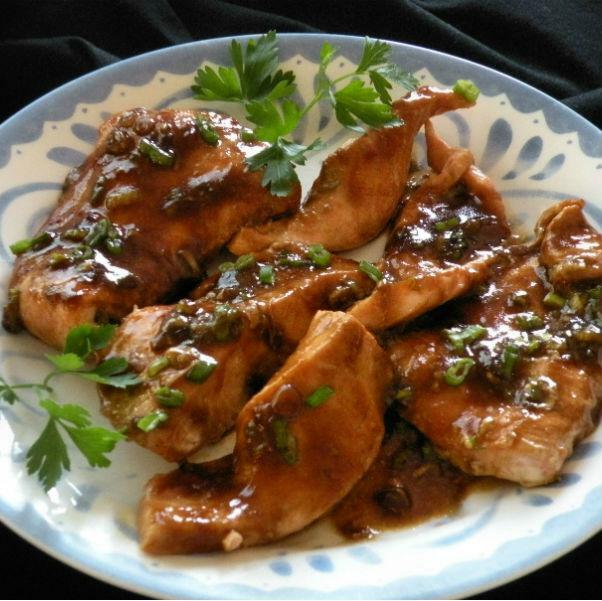 All while delivering hot, hearty and healthy meals the entire family will love. One digital panel, all the functions you'll need. The Delay Timer is designed for people on the go. Place rice in the cooker in the morning, set the Delay Timer to have rice ready when it's needed and come back to perfect rice ready to serve. 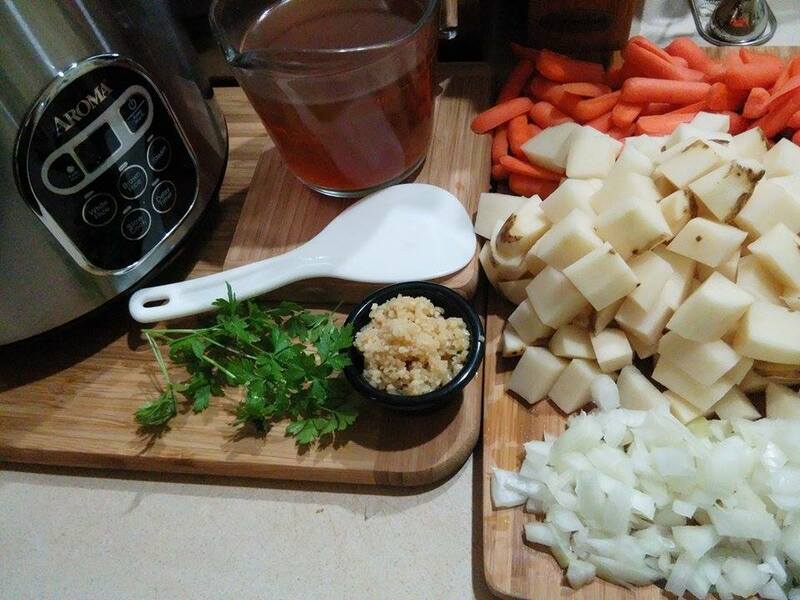 The classic necessity of a meal. 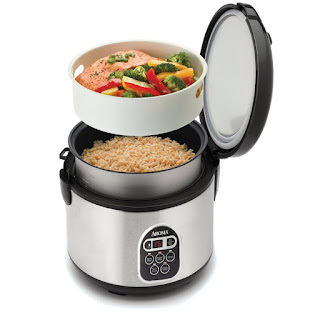 Throw the ingredients, press the button, jog a bit and when you come back, the meal is so ready. You live a healthy lifestyle and yet you do not compromise the taste. 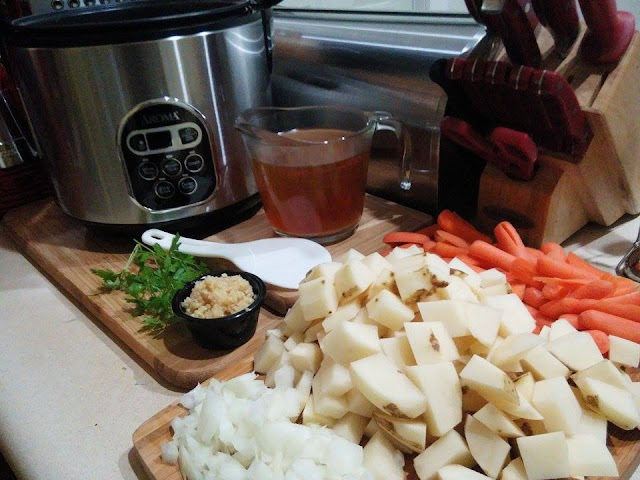 Everything is in the pot and ready to start slow cooking. 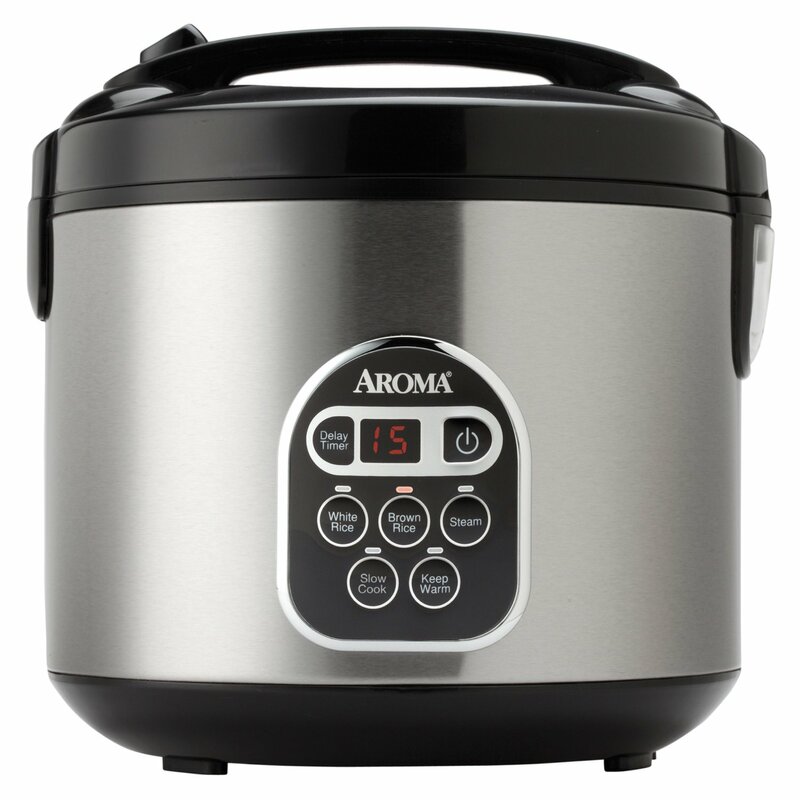 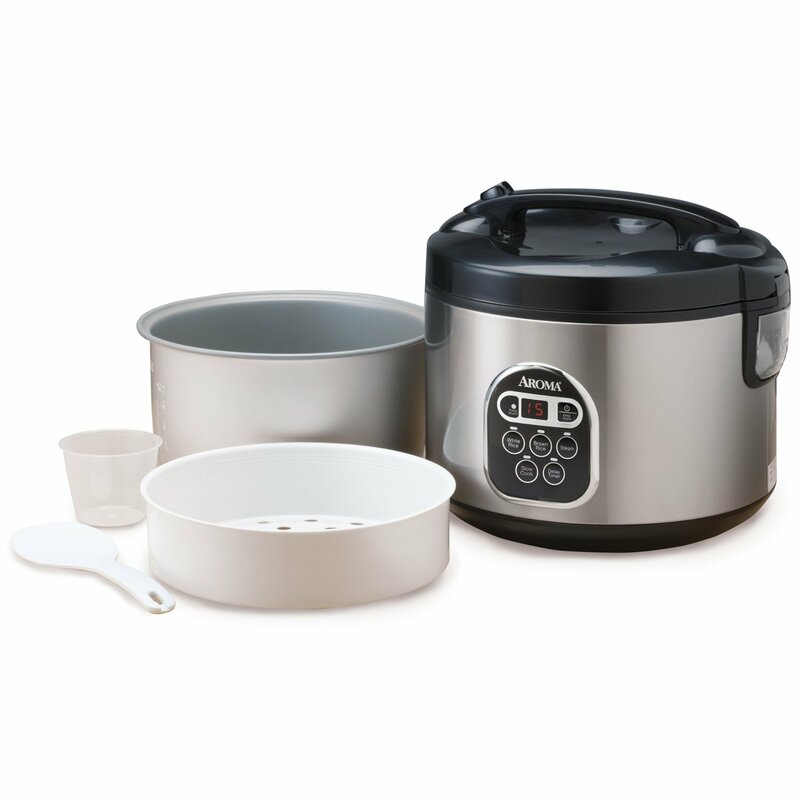 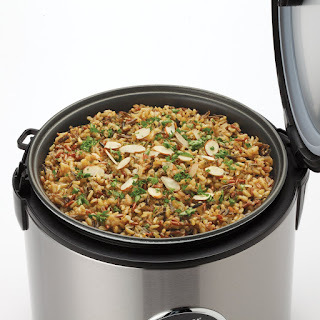 Aroma 20-Cup (Cooked) Digital Rice Cooker and Food Steamer, Stainless Steel. 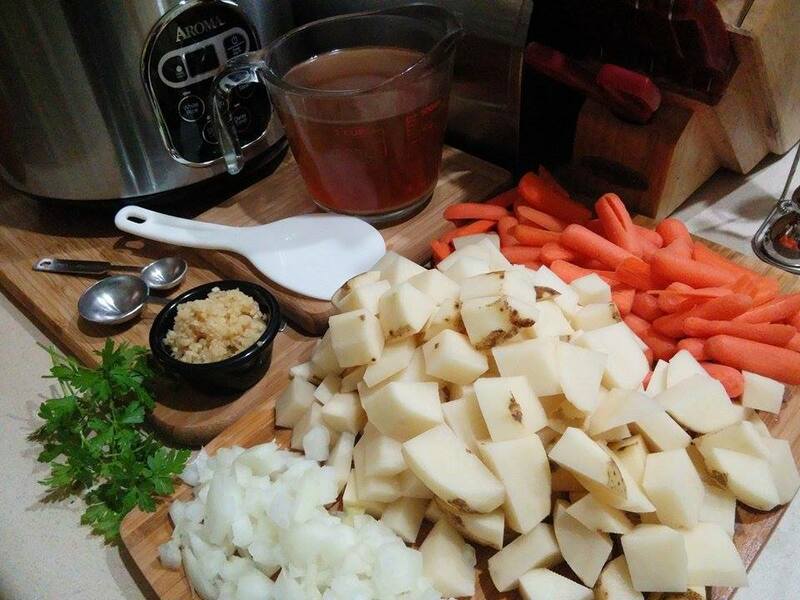 Everything peeled, diced and ready to slow cook. 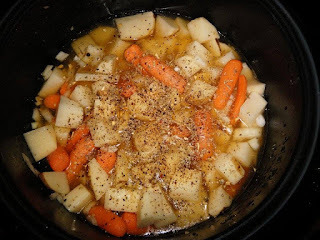 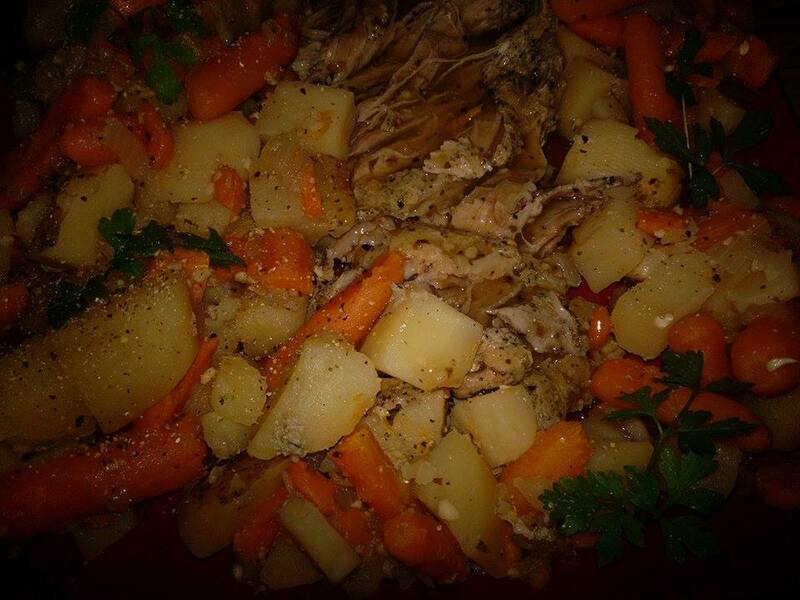 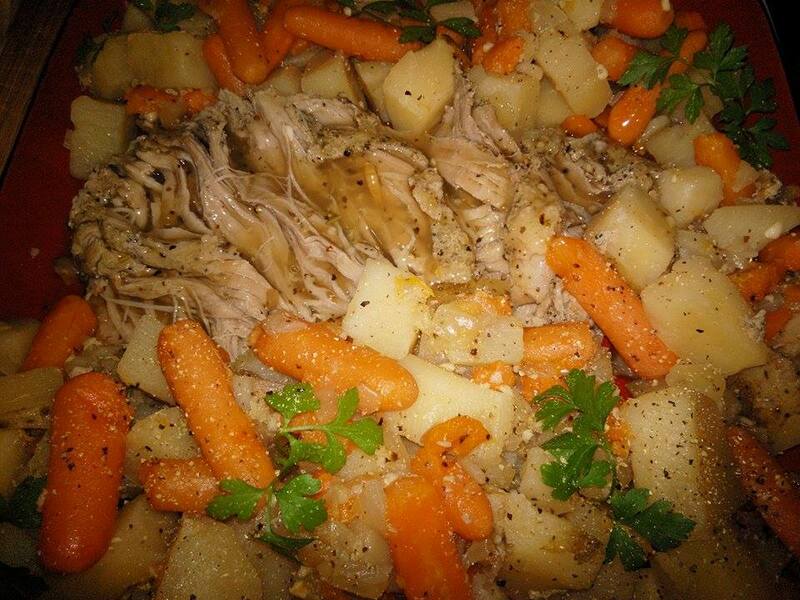 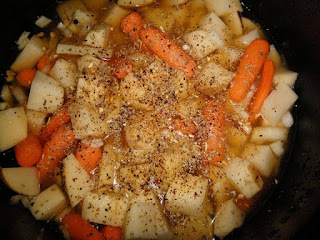 Simple ingredients of pork tenderloin,potatoes, carrots, onion, garlic, stock, fresh herbs and salt and pepper. Pork Tenderloin placed in the bottom of the cooker...ready to add the stock, veggies and seasonings. A couple recipes included, for inspiration! I like that the inner pot is very lightweight, easy to clean, has clear measurements, steam basket fits nicely on top and the lid seals and is easy to open and close. 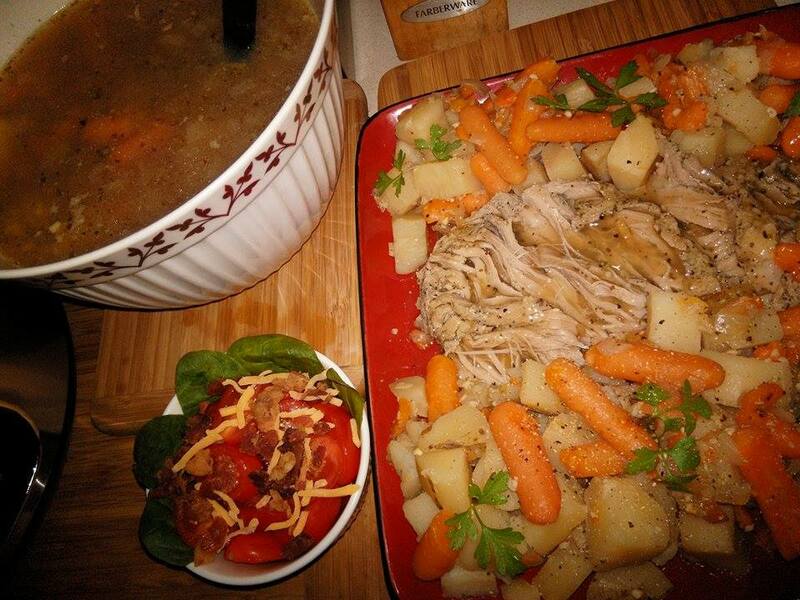 Everything was tender and juicy without being mushy. 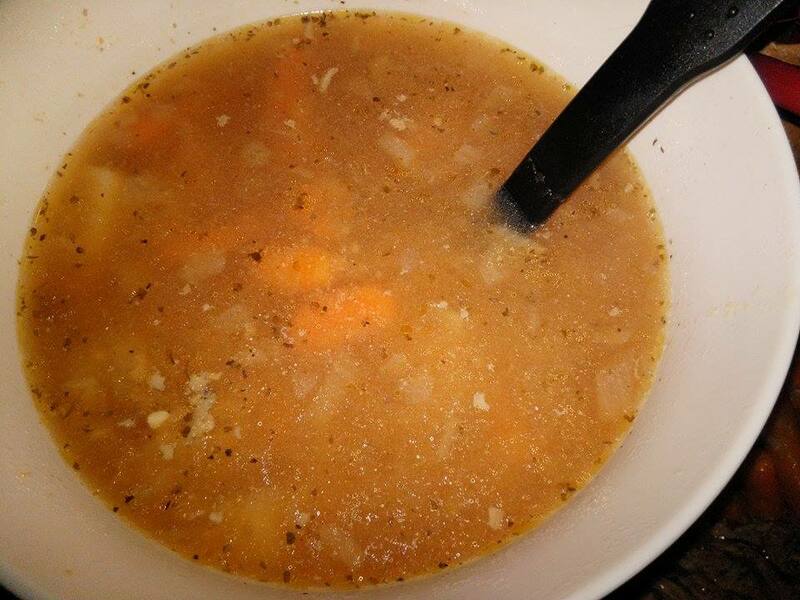 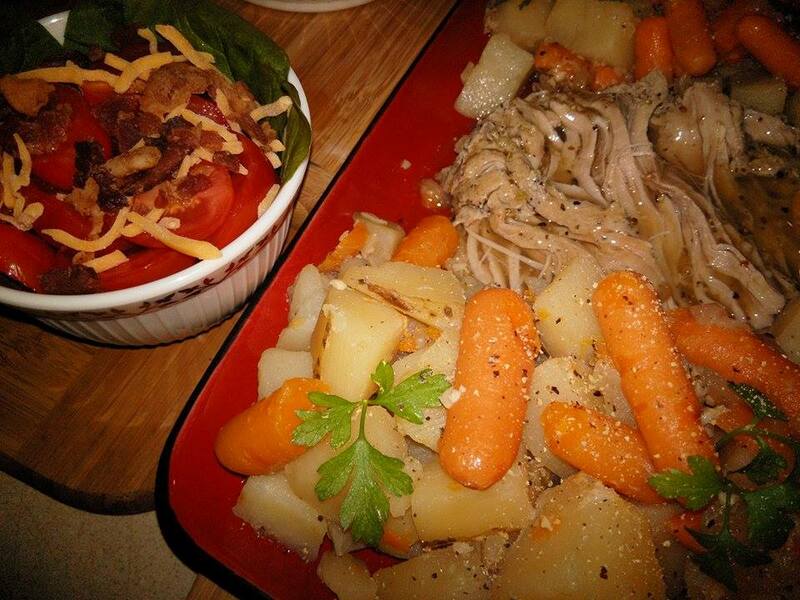 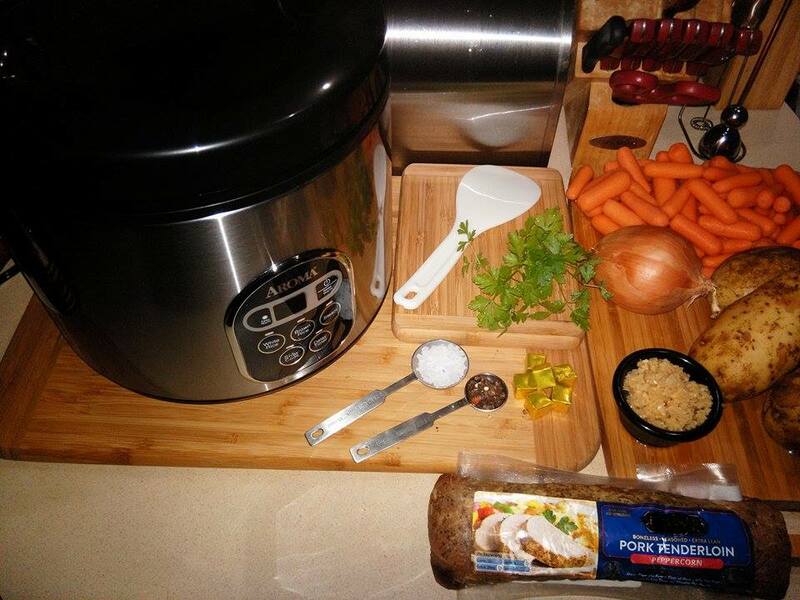 I ended up with this delicious savory broth after slow cooking my pork roast and veggies. 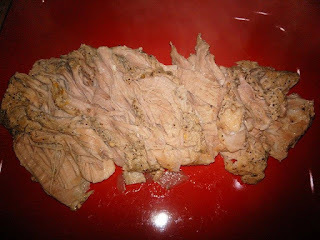 My Pork Tenderloin Literally fell apart after slow cooking for a few hours. 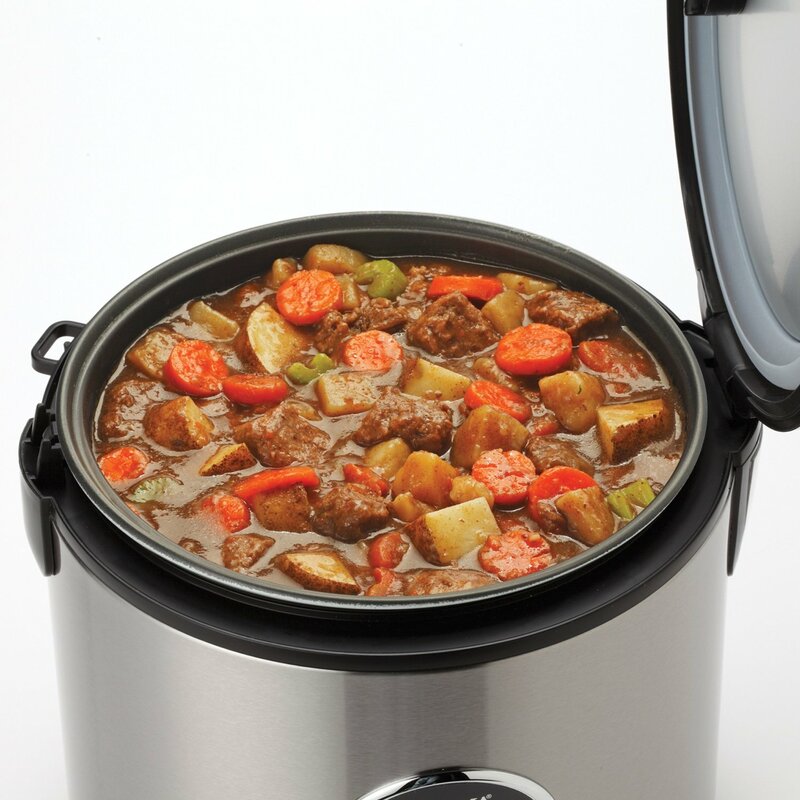 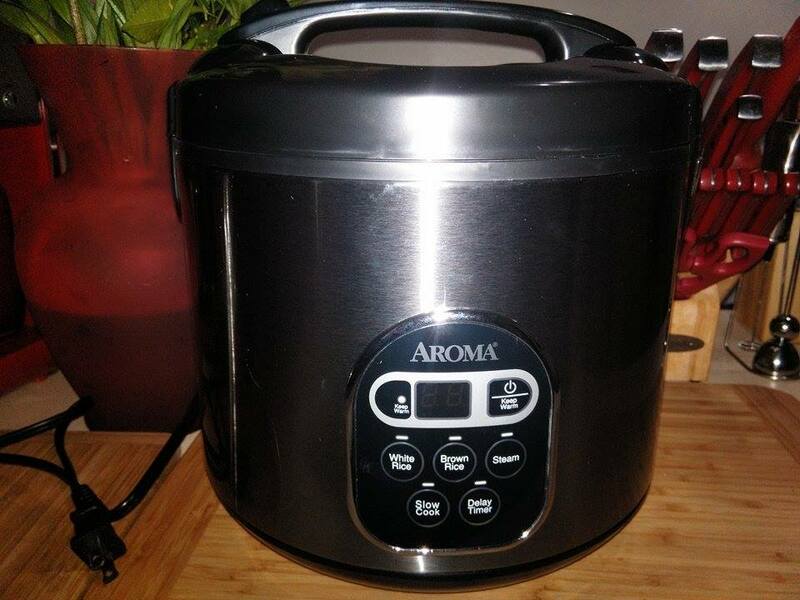 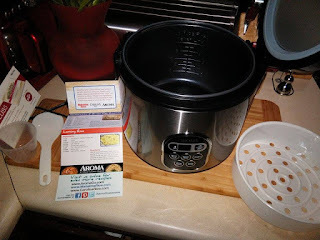 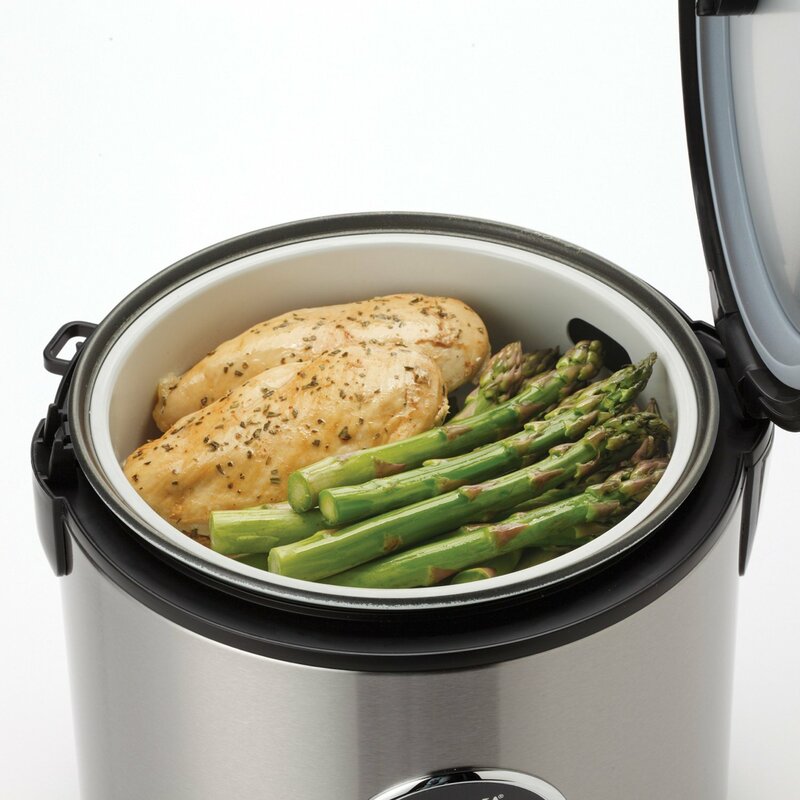 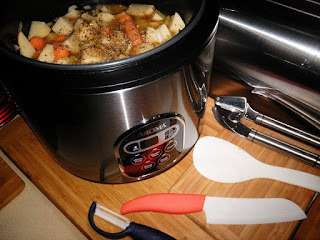 I really like this Aroma Cooker, I love how light the inner pot is, its easy to clean, has clear measurements, the steam basket fits nicely on top, the lid seals well and is easy to open and close. 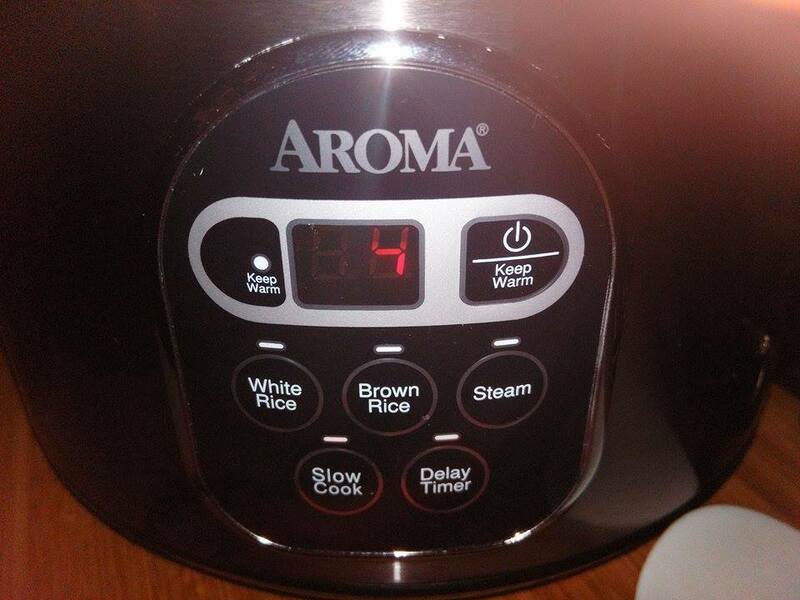 The digital settings are very nice and easy to use. 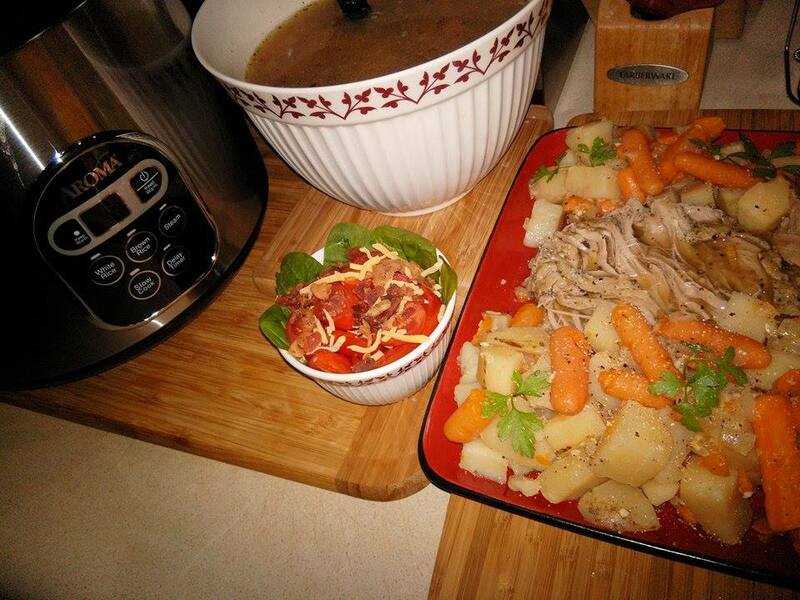 I love that it goes to warm when the dish is done. I really like that the condensation does not build up because it has a steam vent on top. 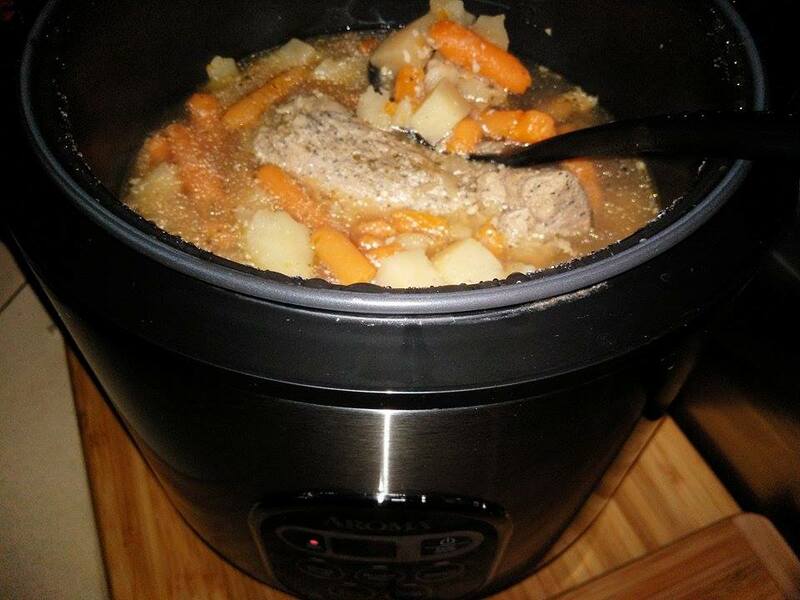 It slow cooked my dinner to perfection. 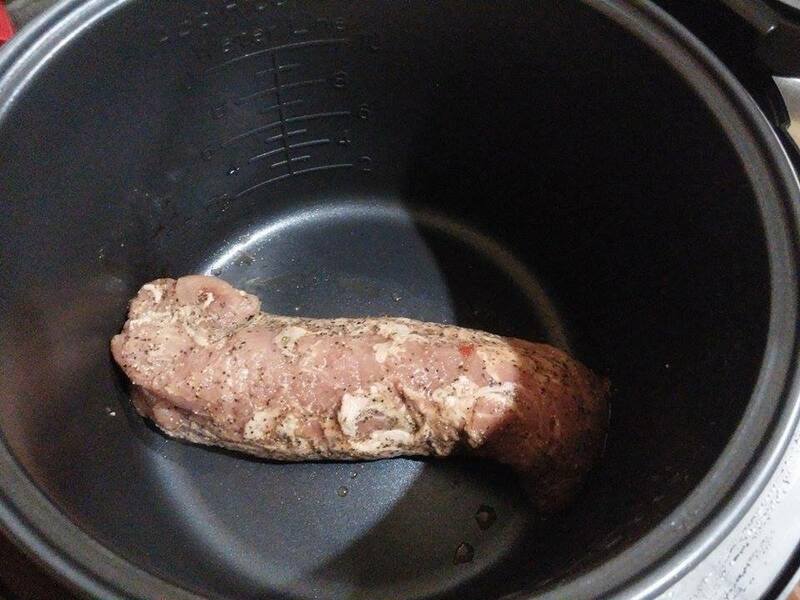 I can't wait to try all the other features. 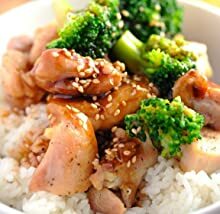 I recommend it!